Honduran migrants in a massive caravan surged across a bridge leading to Mexico on Friday before they were halted in a chaotic confrontation with a phalanx of Mexican police in riot gear. (CNN) — Honduran migrants in a massive caravan surged across a bridge leading to Mexico on Friday before they were halted in a chaotic confrontation with a phalanx of Mexican police in riot gear. “They are fully engaged. They sent 500 ‘federales’ down to the southern border,” Pompeo said, noting that he wanted to “express his sympathy” for the injured officers. “That’s evidence of what this really is,” he said. Peña Nieto called the confrontation a “unique incident,” saying the migrants did not follow the protocols that Mexican immigration officials put in place in anticipation of the caravan. He added that some migrants “assaulted and even injured” a number of unarmed members of the Mexican police before they could contain the violence. “Mexico maintains its willingness to support migrants who decide to enter our country while respecting our laws,” he said. US President Donald Trump, who’s been criticizing the caravan with fiery tweets all week, reiterated his threat Friday that if Mexico doesn’t stop the migrants, he’ll take more drastic action. 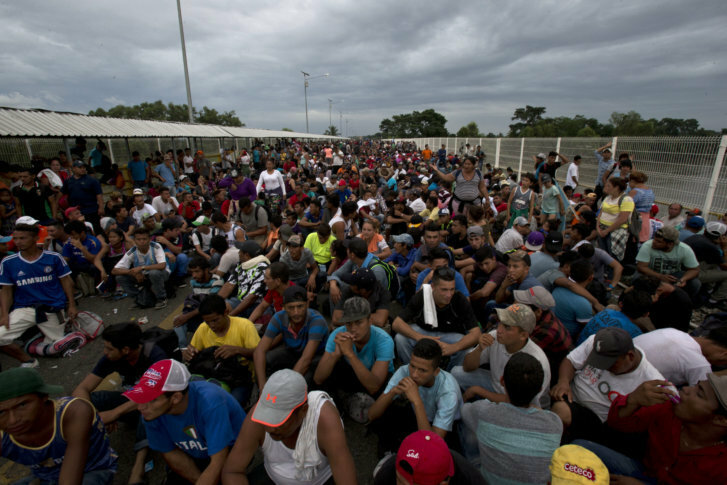 They they streamed through gates on the Guatemalan side of the border around 12 p.m. Friday (2 p.m. ET), cheering and chanting as they marched. Celebratory air horns blared as they headed toward Mexico’s port of entry. At least a dozen migrants jumped into the river. It wasn’t known whether they were trying to swim across to the Mexican side of border, go back to Guatemala or just get relief from the crowds on the bridge. • Anyone who wants to be recognized as a refugee or as a beneficiary of “complementary protection measures” must do so individually. Those who do so will be held “at a migratory station” for up to 45 business days. This appears to be a shift from previous policies, in which humanitarian or transit visas were issued, and migrants were given the option of continuing their journey north if they didn’t want to seek asylum in Mexico. This past spring, when another caravan of Central American migrants crossed into Mexico, such policies allowed that group to make it to the US border. This caravan’s formation comes just weeks before high-stakes midterm elections in the United States, in which many Republican candidates have been echoing the President’s messaging about boosting border security and cracking down on illegal immigration. Trump has pointed to the caravan as a key issue in the upcoming election, describing the group’s approach as an assault on the US border. Immigrant rights advocates have accused his administration of trying to create a crisis to motivate his base. Honduran President Juan Orlando Hernandez planned to meet with his Guatemalan counterpart, Jimmy Morales, Saturday morning to work on “implementing a strategy and logistics for the return of Honduran migrants,” the Guatemalan government said Friday on its official Twitter account.